NCAA women’s basketball is back this week after a long summer and fall of workouts and practices. 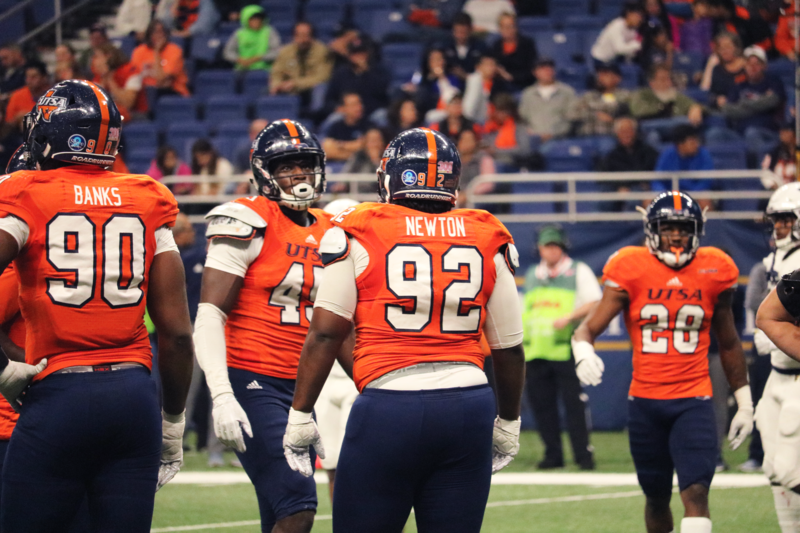 The wait is over, and there is a lot to be hopeful for as UTSA prepares to take on the season. New faces have arrived on campus and the team is bound to get some competitive games in the near future. Players, coaching staff and fans are eager for the season to begin and see what lies ahead for the Roadrunners in the 2018-19 season. Going 9-21 last season, the Roadrunners made it to the second round of Conference USA (C-USA) Women’s Basketball Tournament before falling to Western Kentucky University. This time around, UTSA has a lot to prove this season. The ‘Runners are bound to make a step in the right direction this year. There are some players to look forward to watching as the season-opener is right around the corner. Barbara Benson guarding on defense. After losing key players in 1,000 points club member Crystal Chidomere, three-point specialist Carlie Heineman and defensive force Billie Marlow are some players who are hungry to step up and fill the shoes that were there before them. Returning players, transfers and freshmen are looking to make a splash in the regular season and conference play as the hunt for college basketball playoffs begins. A player who has potential to have a phenomenal season is forward Marie Benson. The Waco native produced 11 double-doubles in 2017-18. Last season, she led her team in three-point field goal percentage, free throws made, rebound average, defensive and offensive rebounds and steals. Going into her junior season, she is already ranked 36 in UTSA history for career points. Adding to an already killer jump shot, Benson will be a leader for the Roadrunners the remainder of her time with UTSA. Forward Tija Hawkins ranked 11th in offensive rebounds for C-USA last season. She added 20 blocks on the season along with 17 steals. The junior from Killeen is going to make a big jump this season as her minutes will increase. 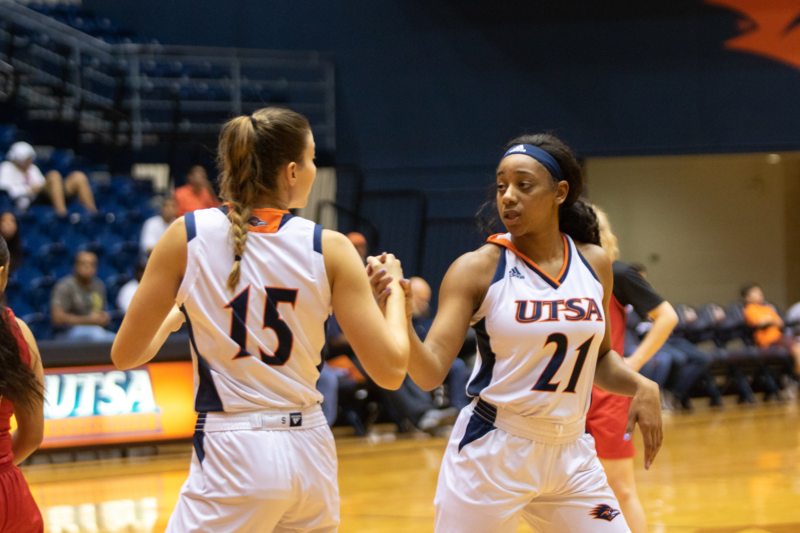 In their exhibition match against Sul Ross State, UTSA dominated 84-41. Benson put up a double-double while Hawkins put up 10 points and six assists. In the third quarter, the Roadrunners only gave up one point to the Lobos off a free throw. The team shot 50.9 percent from the field on Friday — a great way to begin the season ahead. Karrington Donald racing past a defender. The players will be set up to shine this year, especially with head coach Kristen Holt officially having her first head coaching career season under her belt. 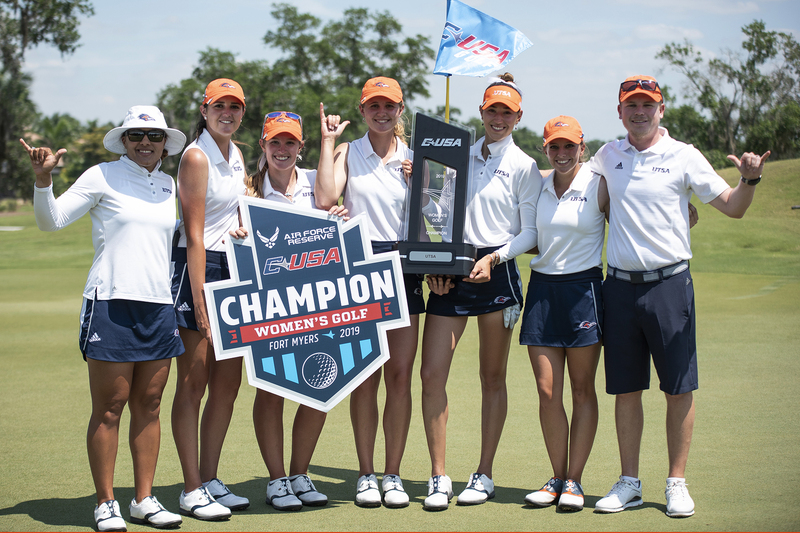 Going into her second season as the UTSA Roadrunner head coach, Kristen Holt will be looking to build off of a year with many positives. After being promoted from associate head coach (2013-2017) to head coach last fall, she led the team to be ranked second in blocks in C-USA. On top of that, the team is third in C-USA in rebounding offense and offensive rebounds. Last year, the ‘Runners went 6-10 in conference play. Going to the second round of the conference tournament last year,was something that has not been done since the 2013-14 season. As a leader who thrives with a defensive mindset, Holt will look to build off of the good they achieved this past season. The Roadrunner’s first game of the regular season will tip-off Tuesday, Nov. 6, as UTSA faces Concordia University at home in the Convocation Center.